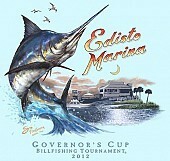 The 24th Annual Edisto Marina Governor’s Cup Billfishing Series was a great success here on Edisto Beach. Beginning Wednesday, July 25, fishermen from all over got together at the marina for nightly weigh-ins of their catch. The event was open to the public so that even all of those people out there without their sea legs could witness the incredible fish these men and women caught out there in the Atlantic. In addition to the fun and sportsmanship the Governor’s Cup has provided over the years, it has also been an integral part of conservation in the state. The event was started more than 20 years ago by the South Carolina Department of Natural Resources. In recent years, there has been an emphasis placed on tagging and releasing billfish caught so that the mortality rate for billfish has gone from 90 percent to 90 percent released. In addition, tagging the fish benefits researchers. According to the website for the Governor’s Cup, a tagged marlin from South Carolina was recaptured off the coast of Brazil after traveling more than 4,300 nautical miles and provided the first known evidence of a trans-equatorial crossing for a billfish. The series has also helped strengthen conservation efforts in the state by helping the passage of a law that bans the sale of billfish in South Carolina. So, if you’re interested in checking out this local tradition or looking to have some fun while you’re here on the island, be sure to catch next year’s event!